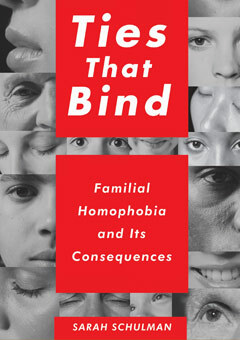 Hailed as “a cri de coeur woven into a utopian vision” by Susan Brownmiller (author of Against Our Will), Ties That Bind is the highly praised work of prizewinning writer and professor Sarah Schulman on “familial homophobia,” a phenomenon that, until now, has not had a name but is nevertheless an integral part of most people’s experience. Ties That Bind invites us to understand familial homophobia as a cultural crisis, rather than a personal or an individual problem. Ambitious, original, and deeply important, Schulman’s book draws on her own lived experience, her research, and her engagement with active social change to articulate a practical, attainable vision of transformation that can begin today.